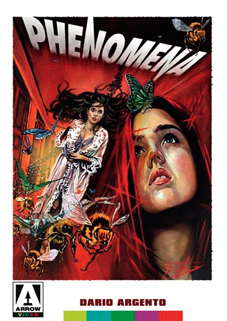 Arrow Video continue their quest to bring the films of Italian giallo master Dario Argento to UK Blu-ray and DVD with the upcoming release of the director's 1985 Phenomena, which was also released under the slightly less classy title of Creepers and stars Jennifer Connelly and genre fave Donald Pleasence. Poor sleepwalking Jennifer Corvino (Connelly) doesn't fit in at her boarding school and her uncanny ability to control insects isn't helping her popularity. With the aid of a local entomologist (Pleasence), can she use her psychic insect skills to find the killer who's leaving her fellow pupils in bloody pieces? Argento piles on the bloody kills and surreal nightmares as the deafening buzz of a million bugs shatters your eardrums in one of the most demented body-horror movies ever produced. Creepers for Creatures – Sergio Stivaletti lives Q&A sessions from Dublin and Edinburgh.